My holiday Netflix binge included six full seasons of “The Great British Baking Show.” As a decades long Francophile and mother of a baker, we were enthralled at the elaborate creations on the show including mille feuille, tartes, and éclairs, which fancy to us were nearly basic to these bakers. During the rains earlier this month, I suggested to my daughters that we venture to Moulin Bistro in Laguna Beach. After over 60 episodes of drinking wine and munching store-bought cookies while watching others bake, I was ready to experience this in person. Moulin’s Instagram feed is awash with patisserie photos of the day’s freshly baked goods, and I hoped they’d have some wine to complement. Although it had poured that Saturday morning, the sun had burst out to blue skies, creating the epic postcard scene as we ventured down Forest Avenue in Laguna Beach. As I had hoped, the bistro was oozing French charm, down to the French music playing overhead and staff with thick accents. 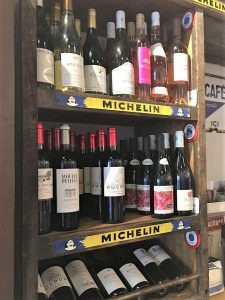 While my daughters ogled the patisserie displays, I hovered over the wine wall of all French imports casually displayed in wooden crates. Given the accessibility of good French wine, I declared this a full-blown lunch rather than a dessert soiree. 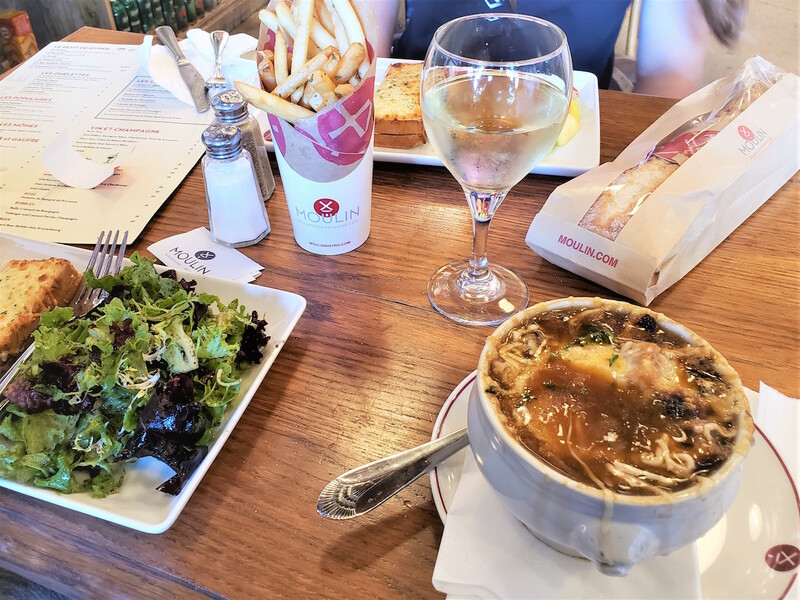 We went tres classique with orders of Croque Monsieur, frites, and French onion soup. I already tend to drink French red blends of affordable Bordeaux and Rhone wines, so I was seeking a unique Moulin pour. I was elated to find a yummy Sancerre poured by the glass for $10. I’m an avid sauvignon blanc consumer, but greatly appreciate the smooth, flinty qualities of a Sancerre over, say, a more acidic Australian pour. In the summer months, I’m all for the overly tart Australian version, but on a January weekend, a finessed, slightly smoky Sancerre was scrumptious with my French onion soup. As most old-world wines, the label denotes the region it is grown rather than the varietal. Sancerre is the specific classification for sauvignon blanc grown in the Loire Valley. Sancerre can also encompass pinot noir from the Loire but is more distinctly known for the sauvignon blanc. The Loire Valley is smack-dab in the middle of France, with the winding Loire River and historic castles as great attractions along with the chateaux. We lingered over our lunch and began eyeing the pastries to close out our Moulin getaway. None of us wanted to leave, though so a second glass of Sancerre was ordered, a chicken pesto sandwich on a fresh baguette to go for my husband, and relaxed, fun chatter with my girls unfolded. I contemplated a glass of champagne alongside our tarte citron, raspberry Napoleon, and coffee éclair but decided to save it until my next jaunt to Moulin, which is expanding to San Clemente!